Europe is a dream destination for many people across the world. Potential travelers spend hours pouring over the glossy images in the best travel guidebooks. One of the major draw cards of Europe is the vast range of diversity in culture and language. Europe has something to offer almost every traveler – history, beaches, culture, nightlife, and nature. There are years worth of experiences and memories to be had in Europe for those who desire it. Yet this diversity can present a problem to many – where should I go and what should I do? 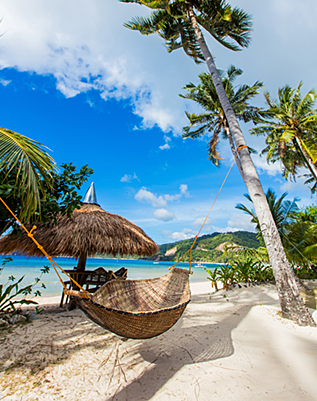 Most average adults only have 2-4 weeks of vacation time per year. With limited time and money, you will need to make some choices about where you will travel. So how can you choose where to go and what to see? Many travelers like to do some research to find out which destinations suit them best. The Internet is a great resource for all things travel. But sometimes the sheer amount of information can be paralyzing when you first begin. That is why many people still turn to the old reliable travel guide book. Plus, you don’t need any cell service or WiFi to use them! Lonely Planet is the largest publisher of travel guide books in the world. Of course, Lonely Planet is a household name and trusted by many experienced travelers. The Lonely Planet books are definitely considered by many to be the best travel guidebooks. 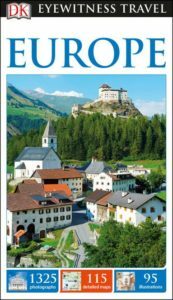 The publishers describe Lonely Planet Europe as a travel guide for mid-range travelers. The book includes fully researched and up to date suggestions from their travel experts, planning, and itinerary help, local secrets, tips and more. Countries covered: Albania. Austria. Belarus. Belgium. Luxembourg. Bosnia. Herzegovina, Britain, Bulgaria, Croatia. Czech Republic, Estonia, France, Germany. Greece, Hungary, Ireland, Italy, Kosovo, Latvia, Lithuania, Macedonia. Moldova, Montenegro, The Netherlands, Poland, Portugal, Romania, Russia. Scandinavia, Serbia, Slovakia., Slovenia, Spain, Switzerland, Turkey, Ukraine. 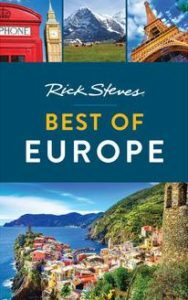 Rick Steves is highly respected and loved by Americans in the field of European travel. Alongside the Best of Europe Guidebook, he has 50+ guidebooks about European travel in his guidebook series. As hinted by the title, this guidebook is a ‘best of’, so there are seven countries included. While a smaller range of countries is covered than the other books in this list, they are more in-depth. This guide includes both popular sights as well as some more unique spots. Countries covered: England, France, Germany. Italy, Netherlands, Spain, Switzerland. 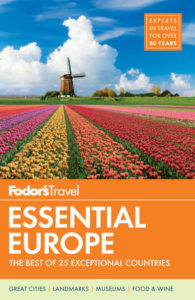 Fodor’s Essential Europe was ‘written by locals’ and is a collection of the ‘must-sees’ in 25 different European countries. It includes hotel and restaurant recommendations and several itineraries. It seems to provide a light overview of the destinations so it would be best as a starting point for deciding where to go at the early stages of planning your trip. Countries covered: Austria, Belgium, Croatia, Czech Republic, Denmark, Estonia, Finland, France. Germany, Greece, Hungary, Iceland, Ireland, Italy, Latvia. Lithuania, the Netherlands. Portugal, Slovenia, Spain, Sweden, Switzerland, Turkey, United Kingdom. As children, many of us grew up with great DK books. The DK Eyewitness Travel Guide Europe is no exception and includes detailed illustrations and information. It has the classic ‘cut-away’ style illustrations of important buildings and sights, and even floor plans for major museums! It includes detailed itineraries and local dining suggestions. Some reviews of the book suggest that it is more of a history book than a true travel guidebook. Nevertheless, it could come in handy for providing inspiration on where in Europe to visit, and it is a beautiful travel book. According to the Amazon rating, this book is the best travel book out of these five. Countries covered: Austria, Belgium, Czech Republic. Britain, Denmark. Finland, France, Germany, Greece. Hungary, Ireland, Italy, Luxembourg, the Netherlands, Norway, Poland. Portugal, Russia, Spain, Sweden, Switzerland. 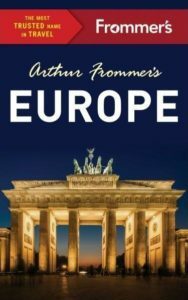 Arthur Frommer is a prominent American travel writer and the founder of the Frommer’s travel series. Many of his guides target the budget-conscious audience and have been in publication since the 1950s! Frommer’s business was sold to several publishers over the years, but he has recently reacquired the rights to guides, and so he has personally edited this guidebook alongside additions from other experts. This tourist guide book lists the pros and cons for traveling to each country mentioned, listing the major attractions in each city. Countries covered: Austria, Belgium, Copenhagen, England, France, Germany. Italy, the Netherlands, Scotland, Spain, Sweden, Switzerland. Printed guidebooks can be considered quite trustworthy. Why? They are written by experienced travelers and are reviewed and edited for accuracy and quality. Most guidebooks these days have an e-book version available, which is great when you are trying to minimize weight while packing. While guidebooks are useful, we also luckily live in the ‘age of the Internet’ and can check online and use travel apps. But in the end, we are all different people with different desires. Your travel dreams are your own, and there is no need to feel ashamed for wanting to go to a ‘super touristy’ sight. In any case, these places are often well-known for a good reason. 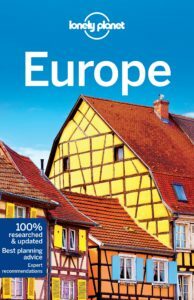 These general Europe guidebooks are great for an overview of what’s on offer. However, consider reading some more detailed resources once you have decided where to go. The best travel guide is the one that suits you and your planning style. Then you will be prepared and ready to visit your travel agent and book your flights! Do you have any travel book recommendations? Do you use them pre-trip, during your trip, or not at all? Comment below and let us know! If you are interested in how travel agents can get the best flight deals, read more about unpublished airfares.